Johan Franzen scored his sixth game-winning goal in the last twelve games with 1:39 left in overtime on Sunday, lifting the Detroit Red Wings to a 1-0 win over the Nashville Predators. Franzen’s goal came off the rebound of a Henrik Zetterberg chance and slipped past the sprawling Dan Ellis. Dominik Hasek stopped 22 Nashville shots to earn the shutout for Detroit. On the day that the Red Wings celebrated legend Gordie Howe‘s 80th brithday, Franzen’s sixth game-winning goal of the month broke the record previously held by Howe. Ellis stopped 35 shots before allowing the goal that ended his franchise-best shutout streak. Didn’t get out of the house on time so I ended up getting to the practice a bit late. Apparently both Holmstrom and Stuart skated but I missed them, no grey jerseys were out by the time I sat down. Meech skated for the first half of practice in a white jersey as a forward and the second half as a defenseman in black. As it was my first Wings practice, one thing that surprised me was that it seemed to be more up-tempo than pre-game warmups. I had expected them to be a bit more similar but I imagine the fact that they’re more structured makes the practices seem faster. Or maybe it’s the use of the whole ice surface. I took about 60 pictures but I haven’t had time to look through them to see what actually came out and how many are duplicates or anything like that. We’ll see if I can even label them properly without the players having names on their jerseys. All-in-all, it was a good time. Maybe not worth driving 90 minutes into Detroit for more than once a month for me but since all the Wings do is offer it once a season I guess I don’t need to worry about that. Definitely a good idea for kids who might not be able to stay up for and/or sit through a whole game. At the start of the season, I ranted about what the Wings were doing wrong and how they could fix it. Open practices are a part of that. Extending the idea, at times when they’re off for several days they should hold them in Lansing and Grand Rapids, to get their fans from outside of Detroit involved. I’m aware they did one in GR this year, I just think it should be a more regular thing. Darren McCarty will make his Red Wings re-debut on Friday as Detroit hosts the St. Louis Blues. Aaron Downey will be a healthy scratch as McCarty skates alongside Mark Hartigan and Dallas Drake. Valtteri Filppula will also return, skating on Johan Franzen‘s wing along with Jiri Hudler. Dominik Hasek is still out with the flu, causing Jimmy Howard to be called back up to backup Chris Osgood. Tomas Holmstrom is also still out. The Detroit Red Wings won their fourth game in a row Tuesday night, earning a 2-1 decision over the St. Louis Blues for their ninth win in the last eleven games. Johan Franzen‘s third period power play goal gave Detroit the win. Goalie Chris Osgood stopped 17 of 18 shots against to preserve the late lead. Franzen scored at 8:22 of the final frame. Nicklas Lidstrom carried the puck down the left side and ran out of room to move, throwing a shot on net. Franzen got to the rebound and knocked it past netminder Manny Legace to put the Red Wings in front. Henrik Zetterberg scored the game’s first goal with 4:11 left in the first period, knocking the rebound of a chance by Dan Cleary past former-Red Wing Legace. Andy MacDonald scored the Blues’ lone goal 2:36 into the second off a turnover at the Detroit blue line. He skated in alone on Osgood with Cleary unable to catch up from behind before he lifted a shot over the Detroit goaltender’s shoulder. The two teams will meet again on Friday night in the second game of the home-and-home series. Dan Cleary returned to the Detroit lineup after missing six weeks with a fractured jaw… Dominik Hasek did not make the trip, staying home with the flu. Being one of the many Comcast customers in Michigan, I wasn’t able to see today’s game as it happened. For seemingly no reason, Comcast decided to air infomercials on the channels that had previously been (and still are) advertised as belonging to FSN+, which the game was broadcast on. I was going to watch the replay on standard FSN Detroit, but I’ve already had one extra-late game this week so I’ll let the DVR get this one and catch the highlights in the morning. I’m interested in seeing if a reason for this “outage” is ever made available. I didn’t call Comcast because I know the CSRs have no idea what’s going on and I didn’t want to have to fight the urge to yell at someone and take it out on them. What I expect to see is Comcast blaming FSN and FSN blaming Comcast. The way I see it, there are three things that could be what went wrong. #1 – FSN+ was actually supposed to be another station. #2 – FSN somehow didn’t transmit the feed to Comcast properly or Comcast couldn’t get the feed in some way. #3 – Comcast didn’t prepare properly in general. I’m leaning towards the last one. If it was the first one, the game would have shown up somewhere on my digital guide and if it was the second one it would have been dead air rather than an infomercial. We’ll see if we ever find out. Even with the lost game, I’m having trouble calling today a bad day. Bruce MacLeod is running with my suggestion of “Tsar of Takeaways” as a nickname for Pavel Datsyuk and since I’m usually not all that quoteable, that’s cool for me. And that missed game was a win, which is also a good thing. The morning after, there are still no answers as to what happened with FSN+ last night. I don’t expect any at this point, which really disappoints me. Red Wings fans weren’t the only ones confused by the mess, it turns out that Penguins fans in State College, PA, missed out on the Pittsburgh – New Jersey matchup and instead got the Detroit – Columbus game. If I had to miss the Wings, I would have preferred to get the Pens and Devils instead of infomercials, but that’s just me. I didn’t stay up for the replay on “normal” FSN Detroit last night. Went through and caught the highlights this morning, some of which have been added to the multimedia section. I don’t know who to blame anymore and I hate that I probably won’t find out. For anyone else like me with Comcast, the game doesn’t appear to be on at all. 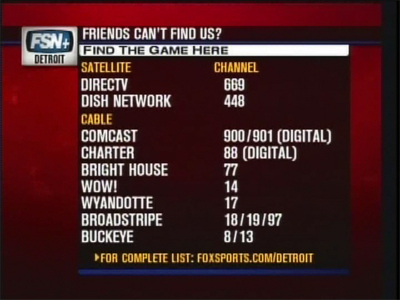 This game is on FSN+ anyway, but the channel that Fox Sports says Comcast uses for FSN+ is showing infomercials. I don’t have any answers, I’m giving up after almost an hour. The game is scheduled to be replayed on FSN at 11:00 tonight.